Yesterday we spent the day at Disney’s Fort Wilderness Resort & Campground with friends (some who had never previously visited) to enjoy the Halloween decorations and nighttime campfire. We had a great day touring the grounds and checking out the remnants of River Country and the Fort Wilderness Railroad. In the evening we attended the Campfire which included Chip & Dale dressed in their Halloween costumes (below, left) and the Pumpkin Decorating Contest (below, right) winner announcements! Get your treat bag ready as you enter into the most anticipated Party of the year! 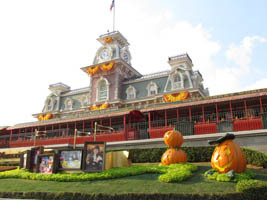 The flickering lights of the Main Street Train Station beckon you to draw near, as you feast your eyes upon Halloween decorations and festive pumpkins. Don’t forget your costume! 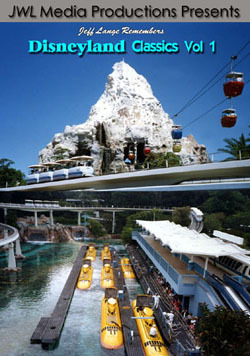 This multi-candy station trail is new for 2011! 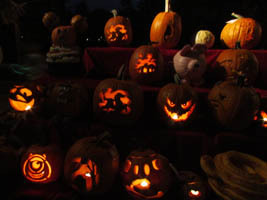 Pumpkins carved with characters from Splash Mountain line the walkways, including Br’er Rabbit, Br’er Fox and Br’er Bear. Once you’ve gathered your candy, we’ll visit some of your favorite Disney characters around the Magic Kingdom! The Seven Dwarfs, Gaston, Duffy the Disney Bear and Mickey & Minnie in their Halloween finery are just a few of the characters that await you! Hooves slap against the pavement as you await the arrival of the Horseman from Sleepy Hollow. Sparks shoot from the ground as the horse gallops by, with it’s famed rider holding an illuminated Jack-O-Lantern in his gloved hand. This video footage is taken from four different angles! “I see you got my invitation!” exclaims Mickey Mouse as he welcomes you to this holiday procession. Your favorite characters will enchant and delight, and a new Mickey’s Boo-To-You float leads the parade! 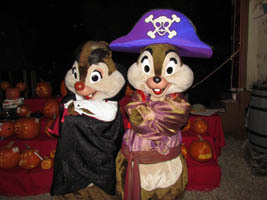 Also new for 2011, Pirate Angelica joins Jack Sparrow on the pirates float. The crowd-pleasing Haunted Mansion grave diggers never fail to delight as they drag their shovels along the ground to provide some added “spark” to the parade. Recorded from several different angles, you’ll enjoy this unique parade for years to come! Take a dash of “Grim Grinning Ghosts”, along with a fun mix of “Scary-Oke” and you’ve got an incredible musical backdrop to the most eagerly anticipated fireworks show of the year! This all-new version of the Villain’s Dance Mix and Mingle features bright new costumes and energetic dance sequences! 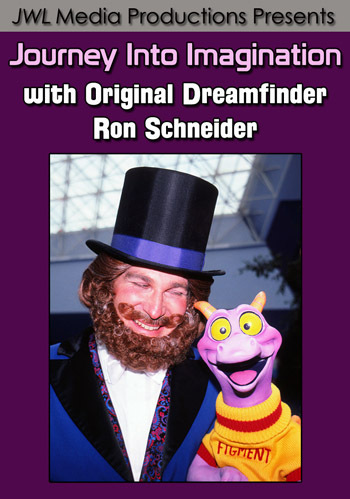 Dr. Facilier takes center stage for this show, with many of your favorite villains including Malificent and the Queen of Hearts adding to the mix! Your Not-So-Scary night closes with a look at spooky Halloween projections in Tomorrowland. 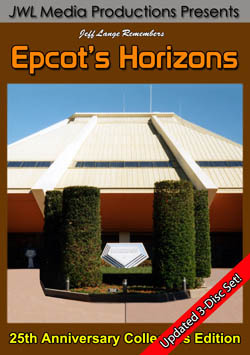 Fix your eyes upon a spider in his web on the exterior of Space Mountain! Stroll down a nearly-empty Main Street, stopping to admire the themed scarecrows at Town Square. Brightly colored lights guide your way to a final goodbye, with “See Ya Real Soon!” bidding you farewell in lit pumpkins. Take one last look back at the fog-enveloped train station before exiting for the evening. Hop in your Doom Buggy and let Jeff Lange be your ultimate Ghost Host with “Jeff Lange’s Trick or Treat 8”! 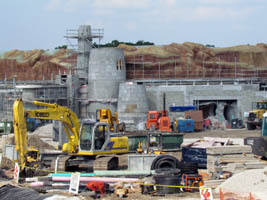 We have a new Fantasyland expansion update today, with photos and video from yesterday! 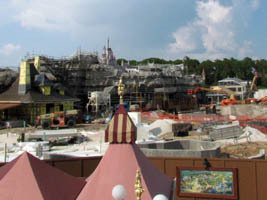 It was nearly a half hour wait for Dumbo the Flying Elephant to get some of our footage, but it allowed a great view over the fence of the Beast’s Castle area (below, left) and The Little Mermaid: Ariel’s Undersea Adventure (below, right). 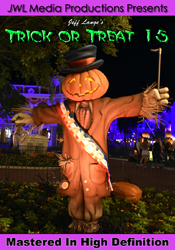 We attended Mickey’s Not So Scary Halloween Party last night, it’s first of the 2011 season! Inflated pumpkins welcomed us as we drove through the toll booth (below, left) and the yearly pumpkins in front of the train station looked especially festive (below, right). 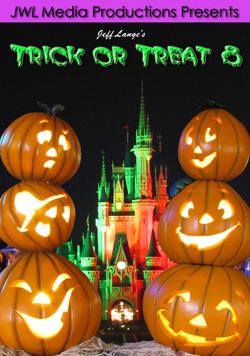 Halloween time is one of my favorite seasons at the park and it really get’s you in the mood to attend these early parties (and the candy doesn’t hurt either)! The Magic Kingdom is decked out for Halloween, and Denise took photos from the front of the park to all the way down Main Street USA (see the full set HERE). It looks really good this year, with new garland and wreaths! 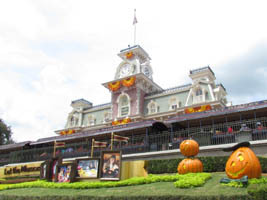 The display is outside as always for Mickey’s Not So Scary Halloween Party (below, left). 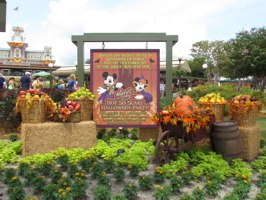 The Magic, Memories and You banner has displaced a couple of pumpkins, which are now inside the park at Town Square. But the front entrance looks great! (below, right). 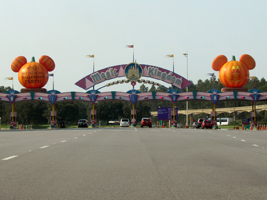 Halloween weekend came and went like a blur, but we had a great time running around the parks and resorts to check out Halloween at Walt Disney World! On Saturday, we went to Fort Wilderness to see the Halloween golf cart parade, decorations, and to have dinner at Trails End. 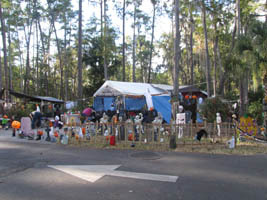 Some guests really go all-out to decorate their campsites (below, left). 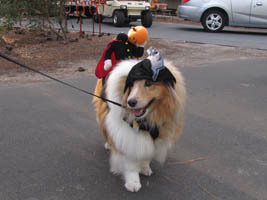 We met many dog owners, this adorable collie below had two outfits scheduled for Halloween weekend (below, right). 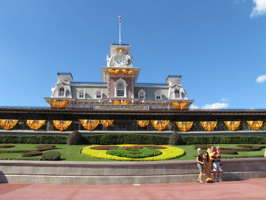 We went to the Magic Kingdom yesterday and were hoping to see the a fully decorated park – and we weren’t disappointed! 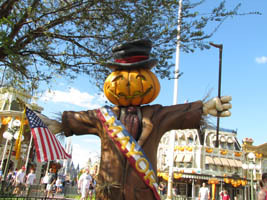 The front of the Main Street Railroad Station had it’s usual Halloween decorations (below, left), and the Mayor of Main Street USA (below, right) looks dapper in Scarecrow form.